In colonial times and infant America, superstitions prevailed. Biblical stories and oral tradition led most to believe that the will of God was sternly acted upon in many ways. It was widely held that natural disasters were a punitive act of God; that the community deserved to be punished for some wicked or immoral activity by a town's citizen or citizens. 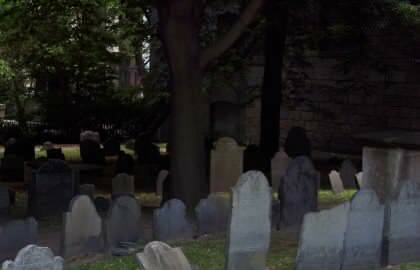 "On May 12, 1780, a remarkable darkness overspread all New England, varying in intensity in different places. In some sections persons could not read printed matter in the open air. Birds become silent and went to rest; barn yard fowls went to roost, and cattle sought their accustomed evening resorts. Houses were lighted with candles, and nearly all out-of-doors work was suspended. The obscuration began at ten o'clock in the morning and continued until night. The cause of the darkness has never been revealed. The air was unclouded." An earlier 1873 description is as follows: "1780. May 19. Darkness prevailed at noon-day throughout New England, said to be caused by smoke from great fires in the woods in Maine and New Hampshire. Many people greatly frightened. A Mr. Willard went on to Boston Common to make observations; while there, a crowd collected, and presently a man came up in breathless haste, saying 'The tide has ceased to flow.' 'So it has for to-day,' said Mr. W. pulling out his watch, 't is past twelve o'clock!" According to Wikipedia, the Dark Day was caused by a huge forest fire in Ontario, Canada, with scars in tree rings in Algonquin Provincial Park connoting that a large forest fire had occurred during that time. Read a first-hand account of the Dark Day as published in a 1780 newspaper.